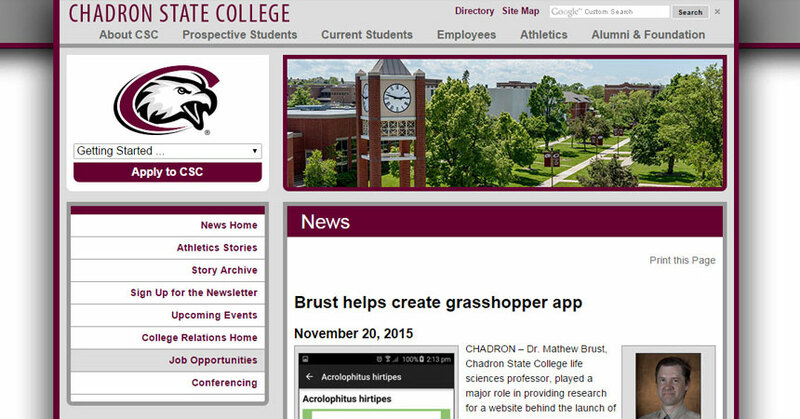 One of ITP's tool authors, Dr. Mathew Brust, was featured in a Chadron State University newsletter item about the Lucid Mobile app Grasshoppers of the Western U.S.
Chadron State University recently featured an ITP mobile app in the news section of their website. Grasshoppers of the Western U.S., Edition 4 was released this year in both website and mobile app versions (iOS and Android). The first author, Dr. Mathew Brust, the driving force behind the fourth edition update, is now a professor at Chadron State University and was interviewed for the story. The article focuses on how the app is helpful for land owners and managers: it helps them determine whether the grasshoppers in their fields are harmful species they should worry about, or less harmful species they don’t need to treat. An ITP scientist was also interviewed and offered comments about the unique nature of this project that has been updated many times since its initial release.